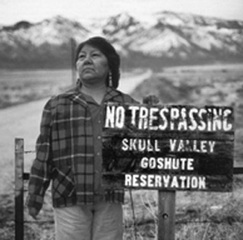 The Skull Valley Band of Goshute Indians Reservation in Utah had been sited as the new neighbors to a large temporary nuclear waste dump. Private Fuel Storage (PFS), a corporation that represents multiple other nuclear companies wants to store 40,000 tons of commercial high-level radioactive waste at this site in Skull Valley. This amount of radioactive waste is about 80% of the total commercial nuclear fuel used by the end of 2004. The Goshute Indians have reservation land that is in the middle of industrial and hazardous waste sited land and they often do no reap any benefits from these facilities. Therefore, after plans under the Nuclear Waste Repository Act stopped a temporary site through the U.S government, the Goshutes agreed to a lease with Private Fuel Storage. However, the lease had not been approved by the government and has prevented this plan from going through. The lease was made in 1997, and now the Goshute people are attempting to stop this nuclear waste storage facility from happening. in 2006, a victory came through litigation that halted transportation of nuclear waste to the facility. However, as recently as 2012, there are talks happening on again looking for a long term yet temporary waste storage facility and Skull Valley would be again on the list of potential places due to the already existing 25 year lease that had been signed. Why? Explain briefly. In 2006, through litigation the project was halted and transportation of the waste stopped. There have been recent attempts to find a new temporary nuclear waste storage facility and there is potential for the new Blue Ribbon Commission under President Obama to consider re-opening the option for Skull Valley. They were able to mobilize and fight back to prevent the storage of hazardous waste in their community. The Goshute tribe is very small and were still able to collaborate to defeated the large companies trying to store waste near them. Hard Won Victory Against Environmentally Racist Nuke Waste Dump Targeted at Native Lands!